Zha Fuxi's list of 35 handbooks not included1 does not include all other known handbooks.2 His list is organized in 7 columns: handbook name, number of folios (below: 2F = 2 folios; NF = not divided into folios), compiler/editor, nickname, reason it is not included, comments. There is further comment on this list here. Seven of these are now in the 2010 QQJC; two others (1571 and 1937) are in Qin Fu (to find these nine search this page for QQJC). Only the first eight listed here are pre-Qing dynasty. 2F; "Contents included in Qinpu Zhengchuan"
6F; "Contents included in Chongxiu Zhenchuan Qinpu"
Same as 新刊正文對音捷要琴譜真傳 Xinkan Zhenwen Duiyin Jieyao Qinpu Zhenchuan? 4F; "qin materials included in Chuncaotang Qinpu"; "only has 4 versions of Ping Sha"
?F; QSCM "apparently in 陝西朝邑 Chaoba district, Shaanxi"
1F; "hand copy"; "in the 民族音樂研究所 Ethnic Music Research Institute"
2F; "hand copy"; "in the 北京圖書館 Beijing Library"
1F; "hand copy"; "in the 北京圖書館 Beijing Library"
1F; "hand copy, mostly from 1722"; "in the 上海圖書館 Shanghai Library"
1F; "hand copy, as next above"; "in the 上海圖書館 Shanghai Library"
7F; "hand copied mostly from 5 (listed) pu"; "天津宋鏡汪涵先生藏 in Tianjin"
1F; "copied from 1539"; "often seen" (for Feng Shui see also under Qinyuan Yaolu). 1F; "按律話再釋原譜" (annotated from 1833); "often seen"
1F; "載北大音樂雜誌五、六、七、八期未完稿 partial copy from some magazines"; "tablature whereabouts uncertain"
1F; "in several issues of the Beijing National Music Reform Society Music Journal, not completed"
In addition to the 35 listed above, there are still others not listed either here or in Zha Fuxi's main list. Many of these either date from or came to light after the beginning of the guqin revival, ca.2000 CE. 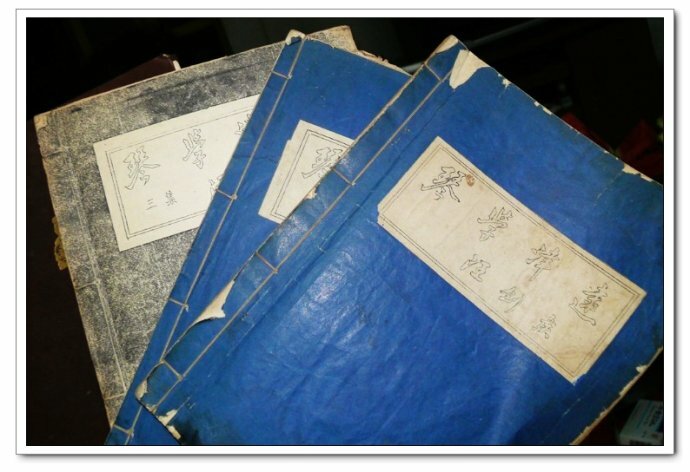 8 melodies; earliest of these Zhucheng handbooks? Earliest versions of many Meian Qinpu melodies? Melodies secretly preserved from a Song dynasty Gugang Yipu? Said to have been published in Chengdu in the 1850s (now available in facsimile edition). Of course, Zha also could not have indexed any handbooks published after 1955, such as Yan Yi Xi Qin Zhai Qinpu. Return to the Qin ToC or to miscellanea.